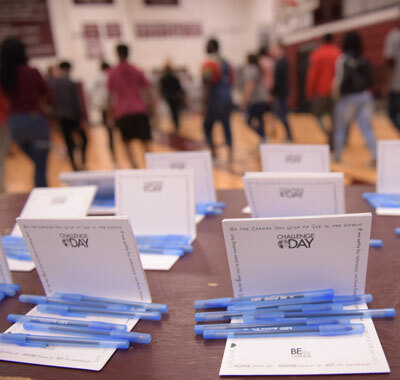 During 10 years as an assistant principal and principal at Patterson Middle School, Kara Trevino, now in her first year as principal at KHS, came to believe deeply in the power of Challenge Day to build compassion on a campus. In the third week of this semester, the school hosted Challenge Day with 100 students and 25 staff members joining in each of two sessions to experience a day of listening, playing and sharing together. 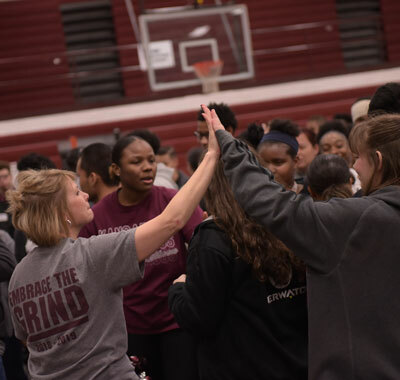 “It’s an extremely impactful day with students and staff where we build relationships at a deeper level,” Trevino said, summarizing the two days of challenge. Sharing their positive experiences, Edwards and sophomore De’Vine Shegog acknowledged that teenagers present a tough audience. Two trainers first briefed the participating adults. Those school staff members spent much of the day with groups of four or five students, serving as mentors while experiencing the exercises alongside students. There were opportunities for games, hugs, dancing, expressing feelings in small groups and sharing with the big group – all designed to move participants beyond comfort zones. One particularly powerful portion asked students to “step across the line” if they had experienced specified challenges such as witnessing violence, neglect or hunger. In small group discussions, students had the chance to share “if you knew me, you’d know” to open up about insecurities, fears and parts of their lives that leave them confused. The principal said she plans to gather participants again to conduct a survey and that she is interested in repeating the activity next year. “It helps so much when we have personal relationships with students and staff,” Trevino said. Even after going through Challenge Day a dozen times or so, the principal said she still learns about herself, the need to listen and to be grateful.